Sell to Us Price: $152.80 each. The Royal Canadian Mint is well know for producing beautifully made coins. 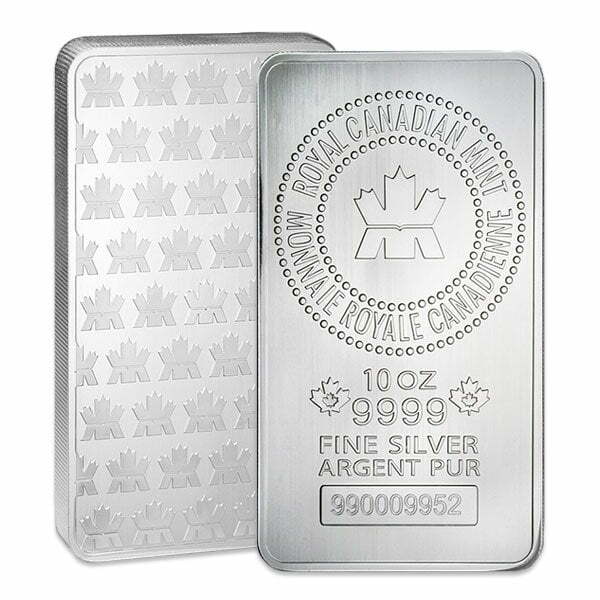 Now Money Metals Exchange is proud to offer RCM's famed quality in .9999 silver 10 oz bars. These bars are a great options for investors seeking a combination of affordable premiums (low price) and the trust and recognizability that comes with a product made and guaranteed by a sovereign ming. They are great for experience stackers as well as beginners learning how to buy silver. The ten-ounce size is among to most popular when it comes to silver bars. The size is hefty, but the unit value is not so high as to render the bar unaffordable for many investors. RCM makes these bars easy to store. 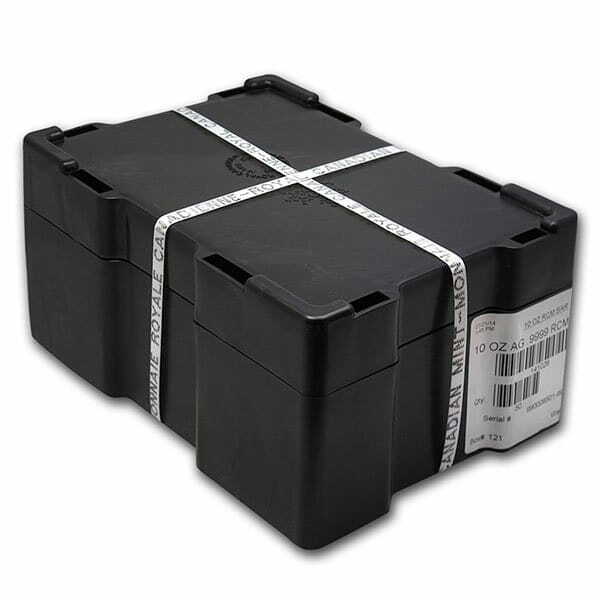 Each is packaged in plastic and is shipped in lots of 50 using the heavy duty, stackable box the Royal Canadian Mint is famous for. Buyers may of course buy these bars in any quantity. These are premium bars. They cost a bit more than privately minted bars. But, like sovereign coins versus silver rounds, buyers can expect these bars to bring a bit more when it is time to sell. The packaging and craftsmanship make the additional premium worthwhile. 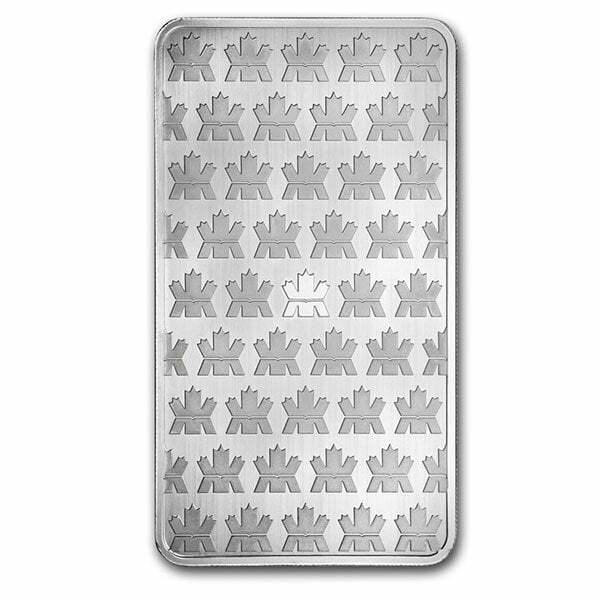 Each of these silver bars is stamped with their weight and purity and carries the Royal Canadian Mint hallmark and security features. These include serial numbers, reeded edges, and a unique and difficult to copy finish. RCM 10 oz bars are minted rather than poured or cast silver. The process of stamping blanks in a minting press generates bars with a more polished finish and clean lines. Minting leads to a more machined look, which many customers prefer. Our current buy pricing is $152.80 each and we will buy up to 100 ounces at this price. Simply call us on any weekday to lock pricing at 1-800-800-1865. Shipping Info* – 4 Week(s) Shipping Delay on This Item – We will ship your order within 4 week(s) of receiving your cleared payment. 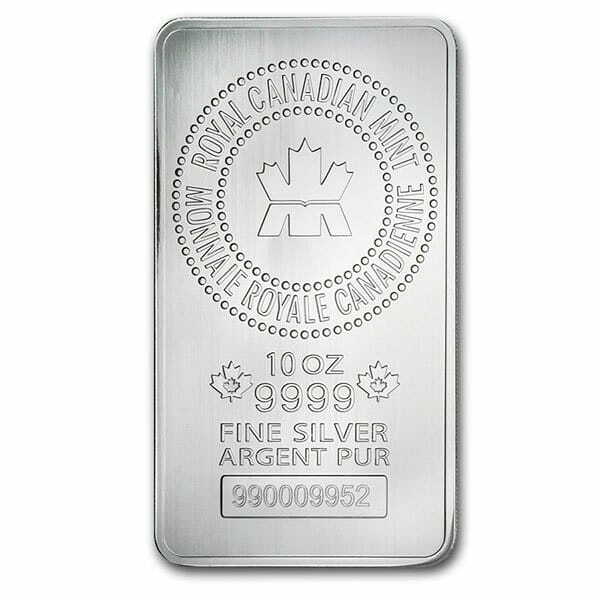 You can now sell your Royal Canadian Mint Silver Bar - 10 oz .9999 Silver back to us online, at a price of $152.80 each!